This couple just brought their love of free samples and discounted groceries to new heights. It was basically love at first bite. Margot Schein and Julian Parris, who are both originally from San Diego, fell in love inside a Costco food court. He had a hotdog, she had a slice of pizza and then they strolled through the aisles together admiring the many discounted goods. And the rest is history. This week, the bride and groom (who now live in North Carolina) flew back to their first meeting place and tied the knot at a Costco in San Diego's Mission Valley neighborhood on Thursday, which also happened to be their three-year anniversary. “We have so much in common, but Costco is the first thing,” the bride told TODAY Food. The couple said their vows in front of Costco’s arsenal of well-stocked shelves, surrounded by a small group of friends, family and store employees. “It’s fitting that these two very practical people should have first met here, brought together by a shared interest in quality discounted goods and inexpensive hotdogs,” the wedding officiant, who is a close friend of the couple, said Thursday morning during the ceremony. The unconventional ceremony was more than just a dream come true, according to Schein, who never thought she’d get married at all. Before meeting in person, the couple first connected on the dating app OKCupid. Schein happened upon her husband-to-be's profile and messaged him because his list of great date ideas included one of her favorite activities: going to Costco. The savvy shoppers decided to meet at their local store, with each bringing along their shopping lists. The first date went so well that the pair headed to a nearby coffee shop right after to continue their conversation. 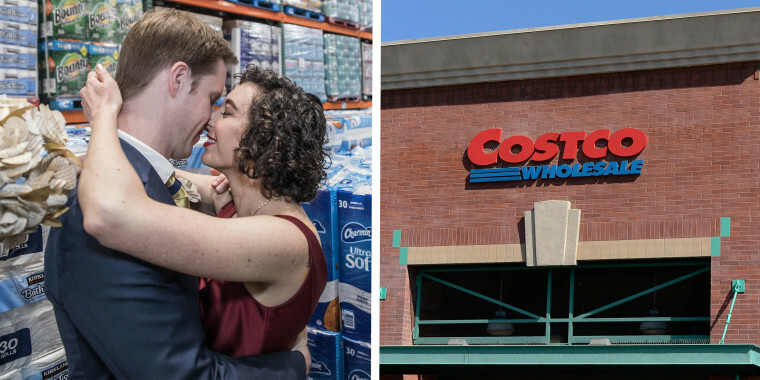 Despite their shared adventures outside of Costco’s walls since that fateful day, the store has always held a special place in the couple's hearts. “I remember the way we meandered up and down the aisles and how I completely forgot to get most of the things I had on my list because I couldn’t take my eyes off of you,” Parris said in his wedding vows. When the duo got engaged in June, they knew there was only one logical place to make it official: “It had to be in the Costco where we had our first date," Schein told TODAY Food. The bride called up Costco’s General Manager and the Mission Valley team exceeded their every expectation, according to the bride. The Costco crew even presented the couple with a single-layer white cake, made in the store’s bakery, a bottle of champagne and their very own customized Costco name tags. After saying their "I dos," the couple strolled the store as man and wife, enjoyed their cake and fell in love with Costco — and each other — all over again.